1. 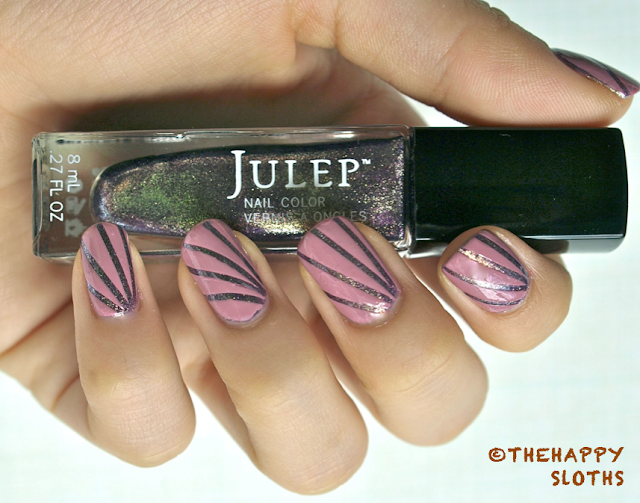 I painted my nails using three coats of my favorite color from Julep called "Julia" (reviewed here), finished it off with a topcoat and wore it for around five to six days until it started chipping and was no longer presentable. 2. I used an alcohol wipe to remove the oil on my nails then waited for my nails to dry. 3. Then I used nail striping tapes and laid out a design on my nails. Be careful to ensure that the tape is smoothed down nicely. 4. Apply a thick coat of an opaque creme polish, I used "Joy" from Julep. As soon as the whole nail is covered with the second color, immediately peel off the striping tape in the reverse order you laid them down. Also remove them by grasping their upper edge and peel downward, a tweezer may be helpful with this process. If the polish starts to dry even a little bit, the end result will be a mess as the polish will get stringy like mozzarella cheese, so work quickly! 5. Apply a topcoat when the top color is reasonable dry and voila, you are done! I hope that was somewhat helpful, I have struggled quite a bit with striping tape in the past and I still have no patience for more complex designs, but those are the steps I followed to achieve this manicure.